With today being Earth Day this is a great time to take steps toward a healthier (and greener) lifestyle. It is estimated that women use over 500 chemicals every day during their beauty regime. YIKES! But there&apos;s something you can do to lower your exposure to these harsh and potentially hazardous lotions and potions. 1. Nix the antiperspirants. Studies have shown that traditional under arm antiperspirants block glands, prevent your body from eliminating toxins properly and those chemicals and heavy metals, like aluminum, wind up in breast tissue and have been linked to breast cancer. Traditional antiperspirants and many deodorants also use synthetic fragrances, parabens, and artificial dyes all of which are also linked to cancer. I switched to using all-natural, powerful baking soda (works like a charm) but for those looking for a prepared deodorant, try one of the deodorants from Kiss My Face. You&apos;ll be odor free, feel fresh and free of harmful substances like aluminum artificial fragrances and colors. My favorite is the Cucumber Green Tea Kiss my Face Active Life Stick. 2. Avoid leaded Lipstick. After I read this report and found that my beloved Mac Viva Glam lipstick contained lead, I vowed to find a red that let me rock my red lips without compromising my safety. I am in love with the cosmetics from Gabriel. Sold at Whole Foods and HERE, you can be rest assured that when purchasing Gabriel cosmetics, all you&apos;re getting is a safe and natural beauty product. While you don&apos;t have hundreds of color choices, they are 33% cheaper than many department store brands, and of course are chemical-free. 3. Go Organic. Buying Organic is not just for food. Buying organic beauty products ensures that you are getting pure ingredients. I am very aware of what I put on my skin (your skin is your biggest, most absorbent organ after all), and choose to only buy organic products. I have recently been introduced to Lavie Organique. I do not have a beauty regime per say, but noticed my skin hasn&apos;t been looking its best. 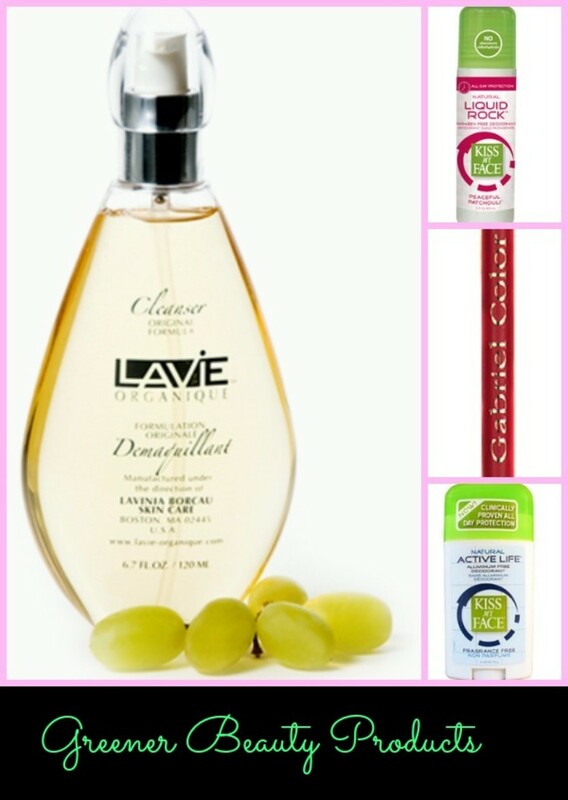 I tried the cleanser and toner from Lavie Organique and I noticed a visible improvement after two uses. You can read their committment to beautiful and healthy skin care HERE. What are some of your favorite green beauty products? Momtrends was not compensated for this post. Samples were received for some of the above mentioned items.